Now you know how much I love my High Brow/Low Brow Faux Lululemon finds and a couple of months ago some of you let me know that Winners was selling ‘Astro Pants’ made by Calvin Klein for about $12. I didn’t get a chance to check them out personally but I’d read that they were pretty well made. Lululemon has taken the bold move to come down on designers that are copying their styles and selling them for substantially less by suing them for copying patents. In this case, the grounds for the lawsuit was that Calvin Klein actually named these pants ‘Astro Pants’ on pants that look remarkably like lululemon Astro Pants. They are claiming unspecified damages, lost profits and royalties. The problem for lululemon with these low brow finds is that they water down the brand appeal for us consumers and really highlights the disparity between value and cost. Lululemon used to have the market corner on quality which was what made them stand out for us. Now that the quality has declined so significantly these past several months, these faux lululemon low brow finds become much more appealing to us, especially when Lululemon is increasing their prices continually and increasing margins. So many companies have been able to copy the designs and in many cases at high quality for just a fraction of the price. Joe Fresh (my personal favorite), Old Navy, Zellers, Target have all come out with athletic lifestyle clothing ‘inspired’ by lululemon. 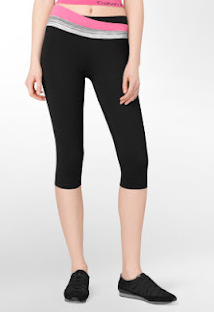 My best find was the recent Joe Fresh version of Lululemon’s $48 Perfect Layer Tee, priced at $12 at Joe Fresh. I would never have purchased the Perfect Layer Tee at lululemon because I find the quality of their burnout material much too delicate and prone to rips. I think the market for these retailers selling ‘low brow’ knock offs is as robust as the market is for pricey workout wear and so I think the most effective strategy for lululemon would be to remarry the elements of the brand that made them so special. Highly Creative Designs + High Quality Garments. There will always be a Calvin Klein out there that will better their prices, what will retain customer loyalty is the knowledge that we are paying the extra for higher quality and not just a brand name. Nobody wants to be a ‘poser’ after all.